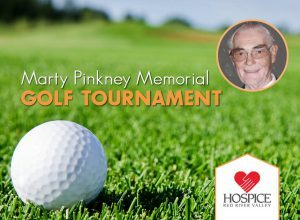 Join us for the third annual Marty Pinkney Memorial Golf Tournament on Friday, June 16 (rain or shine) at Hawley Golf and Country Club. The event kicks off at 1:30 p.m. with a shotgun start. The cost to participate is $75/person or $300/team of 4. Registration is required by June 3. To register, please call Jess Pinkney at (701) 261-0817. This event is proudly sponsored by ABC Seamless. The tournament began in 2015 as a way to honor the memory of Marty Pinkney, a golf enthusiast, well-known city council member, businessman and resident of Moorhead who passed away under the care of Hospice of the Red River Valley in 2014. “We knew we wanted to honor his memory by doing something he loved, while at the same time giving back to the organization that meant a lot to him and the community he served,” said Jess Pinkney, one of Marty’s 16 grandchildren. Proceeds from the event benefit Hospice of the Red River Valley and the Moorhead Fire Department. After Marty was diagnosed with cancer in early 2014, Jess said he declined to go through treatment and instead chose to focus on quality of life, rather than quantity. “The family contacted Hospice almost immediately and began the process of making him comfortable,” Jess shared. “In the end, he passed away with many family members at his side. We wanted the proceeds of this event to go to Hospice of the Red River Valley because of how good they were to Marty and to the family in his final days.” The Moorhead Fire Department was another group that was close to Marty’s heart. “The first responders in the Moorhead Fire Department not only saved Marty’s life when he had a massive heart attack in 1994, but they also saved his home a few years later when the basement caught fire,” said Jess. Marty often stopped into the North Moorhead fire station to chat or have coffee with the staff, and organizers wanted to recognize the department’s impact on not only Marty’s life, but their entire family.